The statistics in the headlines have grown familiar: one-third of U.S. adults are now obese. Among children, the prevalence of obesity has tripled since 1980 and now approximately 17 percent of U.S. children are obese. Obesity-related illnesses cost an estimated $190.2 billion per year , or over a fifth of annual medical costs. Adult-onset diabetes, once a chronic disease formerly confined to middle and old age, has become so prevalent in children that its name is no longer appropriate. Vulnerable populations—people living in low-income communities, people living in rural areas, people of color—are more likely to be obese and suffer ill health due to obesity, and less likely to have community resources that can help. The constant reiteration of such information can create a sense of helplessness in the face of the scope of the obesity epidemic. There seem to be too many problems to fix and the answers aren't always clear—we know that Americans don't get enough physical activity, but is the best answer getting more gym time into schools, or is it improving bike lanes and sidewalks in communities? We know that Americans are eating more sugar and processed food than they did in the past, but is the answer to restrict the marketing of unhealthy foods, or is it a personal responsibility issue where education is needed? In the face of so many problems and so many choices, it can be easy to feel that these factors are out of our control. To take physical activity as an example, studies reviewed by the Committee found that while more high school students are participating in a leisure-time sport, there has been a decrease in the percentage of high school students attending daily physical education classes. At the same time, sedentary activities such as hours of television, computer and video game use per day have been on the rise. Less than a fifth of adults and youth meet recommended physical activity guidelines. In the report, the IOM recommended four research-backed strategies related to the physical activity environment: (1) enhancing the built environment to make sure that there are sidewalks, bike lanes, parks, and neighborhoods designed for being active; (2) supporting community-level programs that encourage physical activity; (3) improving the physical activity standards for children in early child care; and (4) supporting research at federal and local-levels on physical activity. In addition, the report recommended requiring physical education and opportunities for activity to be built into federal and local school policies. This report provides the research-backed evidence that sets the stage for local stakeholders to make changes in their own communities. The second communication piece is the involvement of the professional sector that pilots, tests and implements these policies and programs. In May of this year, the Centers for Disease Control and Prevention's Division of Nutrition, Physical Activity, and Obesity hosted the Weight of the Nation Conference, a three-day event that brought together public health officials, policymakers and researchers from many fields to discuss strategies, programs and policies designed to help Americans lead healthier lives. The conference was a showpiece of best practices, promising interventions, new research and a chance to make connections between stakeholders. At the conference, program tracks were devoted to several areas, including the built environment and transportation, early care and education, state and local practices, hospitals and medical care, school settings, and worksites and businesses. Within each of these tracks, specific programs and strategies were reviewed and discussed. Public health practitioners and policymakers described successful physical activity interventions such as Safe Routes to School and Complete Streets to help create environments where it is safe for families to walk or bike to school, and strategies to help teachers get more activity into early care and education classrooms. Promising food system interventions included new ways to bring fresh and local fruits and vegetables into schools through Farm to School programs, and innovative policies for institutions like hospitals and workplaces to encourage healthy vending machine options. Audience members could then take these evidence-based and promising-practice interventions back to their own communities. At Altarum Institute, we work with a number of partners to implement and evaluate evidence-based and promising-practice interventions and initiatives. For example, we work with YMCA of the USA to evaluate their efforts to increase healthy eating and activity standards in child care settings. With state-level public health organizations, such as the Michigan Department of Community Health, we evaluate policies such as Complete Streets, and nutrition standards for foods served in schools. By working with agencies implementing obesity prevention policies and practices, we aim to continue to advance obesity prevention efforts by adding further knowledge to the field and testing innovative obesity prevention strategies. The final communication piece is outreach to and involvement of the public. Researchers can gather and review evidence and public health and policy professionals can write grant proposals and public health campaigns. However, unless the public is interested and convinced, this work is for nothing. 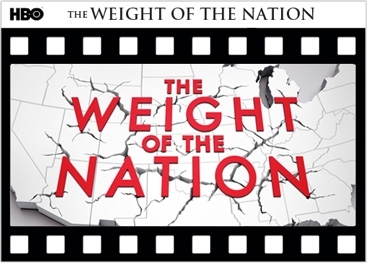 HBO Documentary Films joined with IOM, the Centers for Disease Control and Prevention, the National Institutes of Health, the Michael & Susan Dell Foundation and Kaiser Permanente to create a four-part documentary film called "The Weight of the Nation." The documentary, shown on HBO and available for free online, is accompanied by a companion book, a screening kit, bonus shorts, and a social media campaign. Aimed at the lay person, the documentary is divided into sections that explain the health consequences of obesity, the factors both voluntary and involuntary that can lead to obesity, the impact on children and the challenges in our environment that make it difficult to maintain a healthy lifestyle. These three communication pieces—the research from the IOM and its partners, the practice-based evidence from on-the-ground stakeholders, and personal action from people in their own communities—need to work in concert to cut through the noise of the headlines and focus on improving our health. These three approaches can produce synergistic complimentary efforts towards, for example, improving the number of Americans getting enough physical activity. Research can illuminate the need for specific built environment changes to make physical activity possible, a local public health official can bring the idea of passing a Complete Streets policy to her community, and a community member can both encourage his representative to support this measure and use the improved sidewalks and bike lanes once they are in place. The obesity epidemic can seem overwhelming but there are concrete steps that all stakeholders, from national-level researchers to community members, can take to begin addressing the causes of obesity. The solution lies in giving Americans in their communities the knowledge and the tools to take action. Centers for Disease Control and Prevention. (2012a). Adult obesity facts. Atlanta, GA: Centers for Disease Control and Prevention. Retrieved from http://www.cdc.gov/obesity/data/adult.html. Centers for Disease Control and Prevention. (2012b). Childhood Obesity Facts. Atlanta, GA: Centers for Disease Control and Prevention. Retrieved June 21, 2012 from http://www.cdc.gov/obesity/data/childhood.html. Prevention: Solving the Weight of the Nation. Washington, DC: The National Academies Press. HBO Documentary Films. (2012). "Commit to Help Fight Obesity." Yes, putting money towards prevention is important, especially since it can be hard to attract money to prevention efforts. Treatment has always been more attractive for investment since the returns on weight loss medication or surgery come back to whoever patented or administered the treatment. The money saved by prevention is diluted--it goes to employers who save on health costs, to public hospitals that save money on emergency room treatments, etc. Rarely does that money saved accrue to the entity that paid for the prevention intervention.